In collaboration with Museo Alessi, Mendini is curating and designing “Oggetti e Progetti,” a retrospective dedicated to the last 30 years of Italian design for Die Neue Sammlung, the International Design Museum in Munich, specifically focusing on Alessi’s contributions through the years. Credited by the curators of Die Neue Sammlung as “instrumental in securing the success of Postmodernism,” Mendini has selected an array of Alessi designs, sketches and prototypes ranging mostly from the 1970s through the aughts, on display from May 21 through September 19. 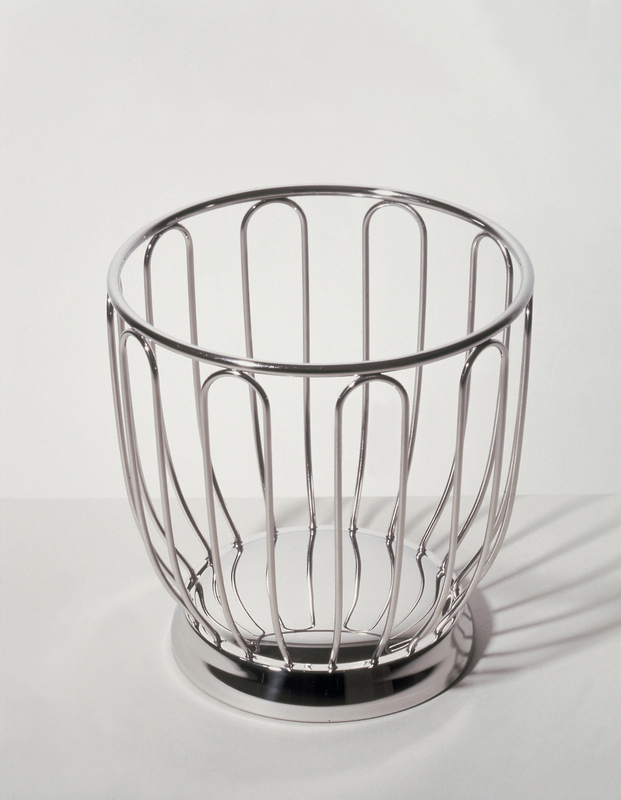 The stainless-steel Fruit Bowl 370, produced in 1952 by the Ufficio Tecnico Alessi, the company’s design hub. The bowl is still in production today, and its inclusion in the exhibition suggests a relationship between the bowl’s earlier, mid-century lines to later Alessi forms. Designer Richard Sapper, born in Munich in 1932 and a designer of ships and watches, executed a bold-lined sketch of an espresso machine for Alessi in 1978. Sapper’s resulting stacked, three-piece espresso machine, in stainless steel, is now in the permanent collection at MoMA, gifted by Alessi to the museum. Different variations of the espresso machine are abstracted by Sapper’s wooden models of the 1978 design. Pritzker Prize–winning Italian architect Aldo Rossi (1931–1997), who designed among many other buildings the Bonnefantenmuseum in Maastricht, sketched his La Conica espresso machine (1980–1983) in 1984 as a haven for children returning home from school. Introduced four years after La Conica, Rossi’s La Cupola espresso maker borrowed very literally from his background as an architect. The sketch of La Cupola, from 1987, shows the piece as a purely architectural element among its classical, inspirational brethren. The 9093 kettle, conceived by architect Michael Graves in 1985, was the first item by an American to be included in Alessi’s catalogue. With its telltale ’80s Deco-revival accents and bird whistle, the kettle remains Alessi’s best-selling item. A holiday gift from Michael Graves to company head Alberto Alessi in 1995, this original sketch denotes 750,000 sales of the 9093 kettle. Designer Riccardo Dalisi, born in Potenza in 1931, anthropomorphized samples of his Neapolitan coffee maker, finished in 1987 after nine years (and 200 prototypes) in the making. The concept for his “Ricerca Napoletana” (“return to Neapolitan”) is said to draw on historical, anthropological and poetic sources, and evokes the classic, pre-1950s stovetop drip-brew coffee maker. Sejima and Nishizawa, who designed the 21st Century Museum in Kanazawa, Japan, and the New Museum in New York, drew their tea and coffee towers as cartoonish sets of large and small tea and coffee pots.